October was a rather busy month. My first term of teaching and marking at Birkbeck has meant that I know a good deal more about eighteenth-century London infrastructure, English Civil War veterans, and the historiography of the Reformation than I did a few weeks ago, but research and blogging have been neglected. I have, however, come across a few tasty tidbits that deserve to be shared with the world. This is, in some ways, simply a continuation of the conversation (here and here) we’ve been having about archives. An archivist friend passed this on and, like all good jokes, it contains at least a kernel of truth. Having worked in the Borthwick for a year, I can say with some certainty that it would be entirely possible to use the limbo between the public reading room and the strongroom to erase someone with a ‘misplaced’ inkblot or an ‘accidental’ torn page. 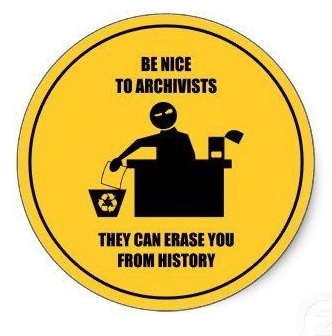 So be sure to greet your archivist with a friendly smile … or risk the posthumous disappearance that befell some soviet dissidents. At 15, Henry Cole, later to find fame as organiser of the Great Exhibition began working with the records of the British government. Shocked at their poor condition he pioneered reform of what became known as the Public Record Office – now The National Archives. 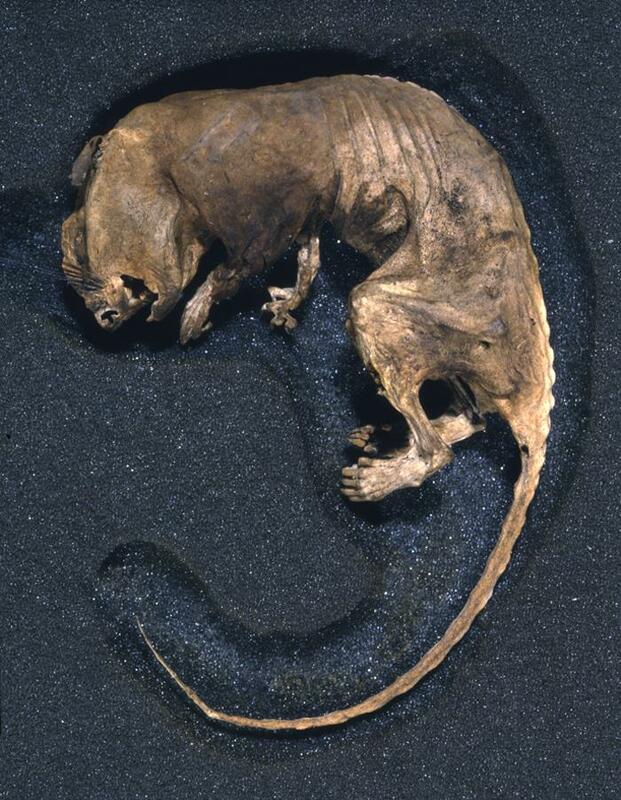 This rat, with a stomach full of chewed document, was used as evidence for the poor condition of the records. Yep, that’s right. We owe the wonderful institution that we once called the PRO, founded in 1838, to a rat stuffed with irreplaceable manuscripts. And archivists, being the dedicated – one might say obsessive – guardians of history that they are, created a special foam case to preserve this momentous rat for posterity. Ever wanted to know what happens behind the scenes at a busy city archive? Of course you do! Well, if the Huntington’s Verso blog isn’t fulfilling all of your archive-blogging needs, check out the team at York who are describing their on-going project to catalogue the city’s immense civic records. Although not specifically ‘early modern’, it does have some fascinating ‘lucky dips’ (what we here call ‘found art’), including councilmen watching naughty films and railwaymen complaining of mouldy fish cakes, as well as some very pretty visual maps of the archives themselves. If you’re a historian – professional or amateur – I think it can be immensely profitable to get a sense of how archives (and archivists) work. Sure, the difference between ‘functional’ and ‘structural’ arrangements may not sound especially interesting, but it can make a real difference to how you go about your research. This one comes from Tim Hitchcock, and is rather more serious. I think he makes the point I was trying to make here much more effectively than I ever could. For both technical and legal reasons, in the rush to the online, we have given to the oldest of Western canons a new hyper-availability, and a new authority. With the exception of the genealogical sites, which themselves reflect the Western bias of their source materials and audience, the most common sort of historical web resource is dedicated to posting the musings of some elite, dead, white, western male – some scientist, or man of letters; or more unusually, some equally elite, dead white woman of letters. And for legal reasons as much as anything else, it is now much easier to consult the oldest forms of humanities scholarship instead of the more recent and fully engaged varieties. It is easier to access work from the 1890s, imbued with all the contemporary relevance of the long dead, than it is to use that of the 1990s. Without serious intent and political will – a determination to digitise the more difficult forms of the non-canonical, the non-Western, the non-elite and the quotidian – the materials that capture the lives and thoughts of the least powerful in society – we will have inadvertently turned a major area of scholarship, in to a fossilised irrelevance. It would be a cruel irony to digitise vast new swathes of text and images only to discover that we’ve accentuated the very biases that scholars have been fighting against since at least the 1960s. That is not to say that we shouldn’t try to make ever-more sources freely and easily available online – just that we should beware the consequences of grabbing the ‘low-hanging fruit’ and neglecting less accessible sources. We must make a real effort to move beyond ‘the musings of some elite, dead, white, western male’ and save other voices ‘from the enormous condescension of posterity’. Update (13/01/13): The York archives blog did a new ‘Lucky Dip’ post that early modernists might like which looks at a late seventeenth-century Chamberlain’s Account Book. This entry was posted in Theory and methods and tagged deep thoughts, found art, pretty pictures, the craft by Brodie Waddell. Bookmark the permalink. Hi Brodie – thanks for linking to my blog! So far the lucky dips have been modern because aisles 1-3 happen to contain modern documents, but as I move round there should be some early modern popping up, including property records and account rolls : ) I might start tagging them by age to make it easier for readers with specific interests to find what they like. Well thanks for writing the blog, Justine. It’s been fascinating. Tagging by period might be helpful, though I think all historians can learn from it, irrespective of their particular specialism.